The first electric Citaros, scheduled to begin production at the end of the year, will offer a range of approximately 150km and will be ‘future proofed’ against new battery technology. 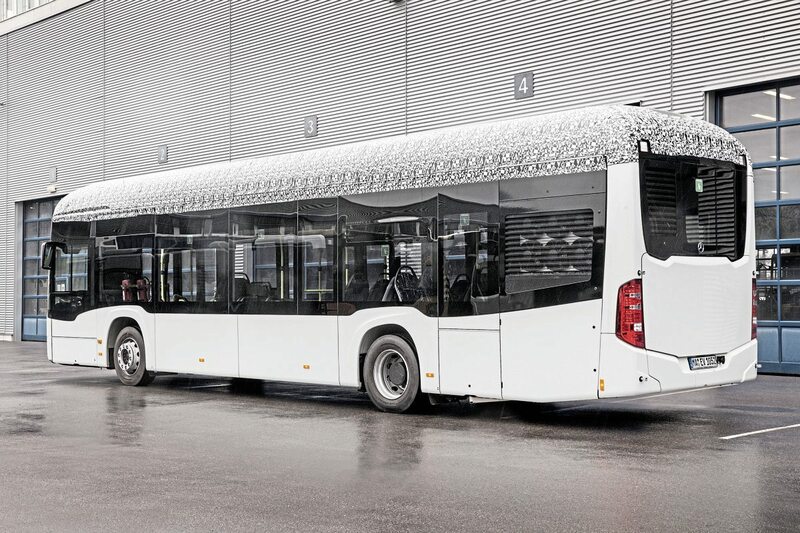 With Mercedes-Benz seeming to be ‘late to the party’ with electric buses, Head of Product Engineering, Gustav Tuschen, not only described the vehicle and explained key systems, some of which are very innovative, he also revealed the approach to the way in which vehicles are developed. In the past, after a model has been introduced there was a facelift or new generation six or seven years later. Now, under a programme of accelerated development, buses would get better “at unprecedented short intervals,” he said, flagging up the commensurate speed at which new technologies are emerging. “This will be achieved because we use components and technologies that were not yet available in this form one or two years ago. 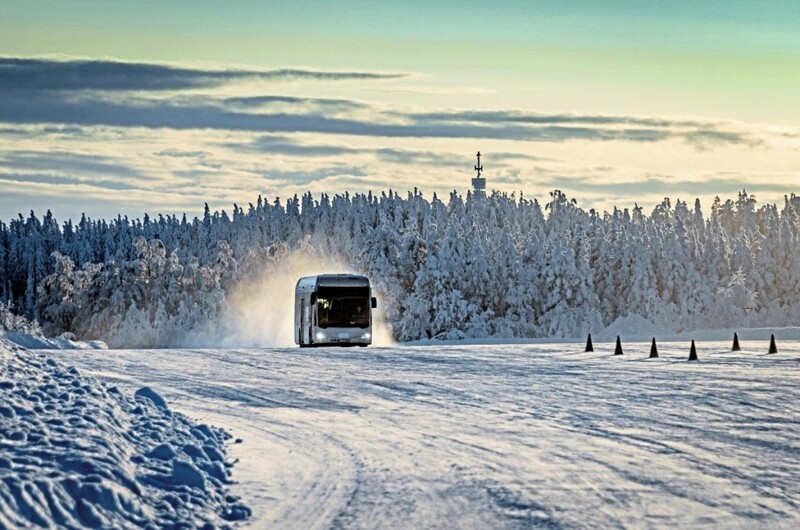 “And we implement innovative ideas that were still non-viable just recently.” This does not mean that any aspect has not been thoroughly tested, because a 12-strong fleet of prototypes and test buses has been built and utilised, including spells within the Arctic Circle in 2016 and 2017 and testing at the other temperature extreme in the summer sun of Granada in Spain. Gustav described a vision of the year 2030 in which 75% of city buses are zero emission electric (electric registrations having reached parity with diesels in 2025), urban buses largely drive themselves, recharging en-route has become a thing of the past because buses have a 400km range on one charge and total cost of ownership (TCO) is less than for a diesel bus. He believed this represented a realistic vision though he also stressed that the combustion engine will continue to have its justification for quite some time. 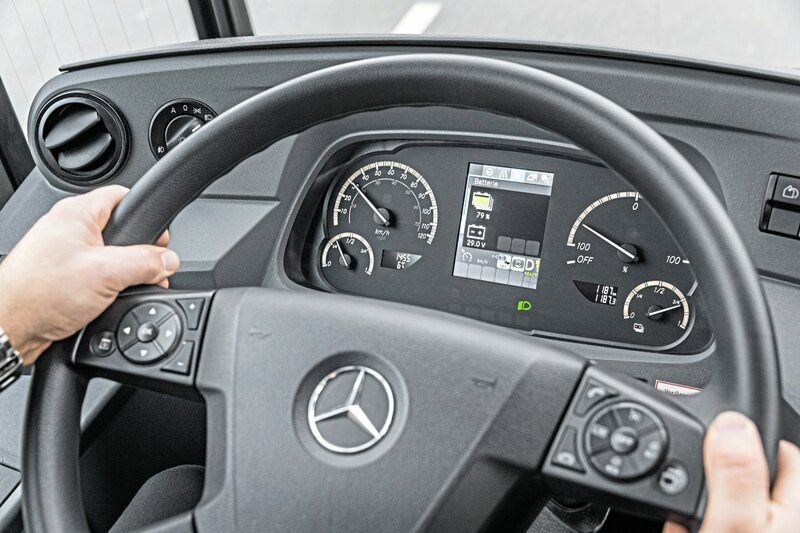 Daimler describes the 150km claim as a ‘real world figure’ equivalent to 250km in ideal conditions, and sufficient to suit the bus to around 30% of urban routes. To achieve this, it will initially have a nominal capacity of 243kWh. The high performance lithium-ion batteries have been developed in partnership with Akasol using 37Ah Samsung prismatic cells. A minimum of six and a maximum of ten battery pack modules will be fitted on each bus. Four go where the diesel engine once was and between two and six on the forward section of the roof, mounted on rails developed for the Citaro NGT natural gas bus. Of modular construction, each battery comprises 15 modules, with each module made up of 12 cells, along with a control unit. In order that they operate optimally and achieve a long life they are kept heated to around 25°C. The next stage will see capacity upped to in excess of 300kWh with the aim of achieving ‘a systemically relevant range of 250km’ which Daimler research shows would be sufficient to cover 70% of urban European routes without the need to recharge during the day. Operators wishing to upgrade with the more powerful battery packs will be able to do so but, although Daimler is looking to maximise range from depot charging, it recognises that opportunity charging will be required for some longer route duty cycles. It will be offering a pantograph facility of the operator’s choice in due course for Citaro. Depot charging employs the industry standard Combo 2 system suitable for charging powers of up to 150kW and currents up to 200A. The plug-in socket is mounted above the front wheelarch where the diesel filler point would normally be. Different optimum depths of battery discharge can be selected for particular applications. Charging time from empty depends on the output power of the recharging system and could thus vary from three to 11 hours (at 80-20kW). All roof-mounted components related to the electrics are easily accessible and in designing the roof covers feedback on earlier fuel cell and CNG applications has been valuable. 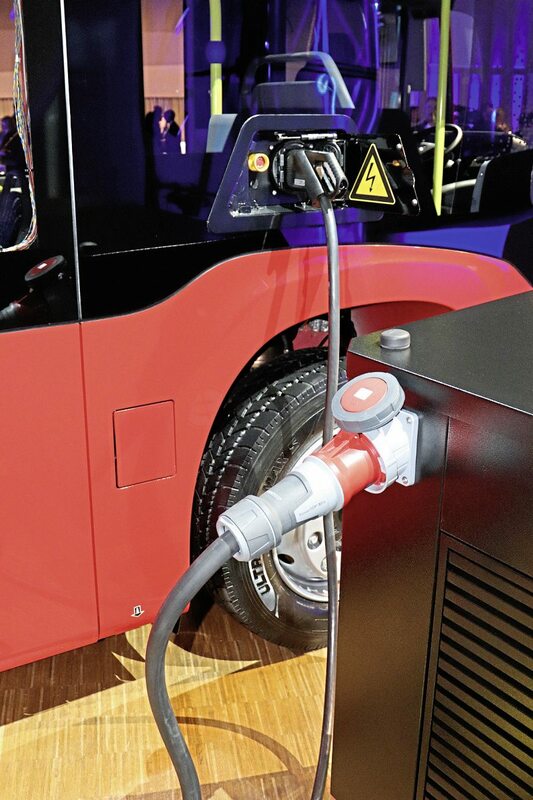 As it has before, Daimler uses the ZF AVE130 portal axle with wheel hub electric motors to drive the bus. Each water-cooled asynchronous hub motor produces a peak output of 125kW and torque of 485Nm, all of which is immediately available from pull away. During braking, the wheel hub motors act as alternators enabling kinetic energy to be recuperated and stored in the batteries. Electric bus range is all about the way energy is used and managed. To this end Daimler has come up with a variety of ways of limiting energy consumption. 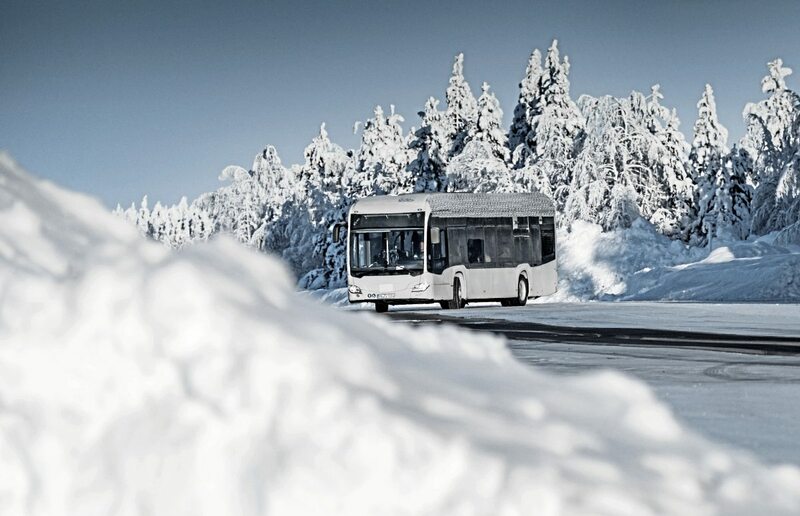 Around a 40% energy saving on the running of the heating, ventilation and climate control compared to a diesel Citaro has been achieved despite the absence of the diesel engine as a heat source. All heat sources have been integrated and auxiliary heating systems integrated within the thermal management system. A sophisticated heat pump system has been introduced which takes energy consumption down to 2.0kWh (from 2.8kWh) when the external temperature is -10°C. The air conditioning system uses carbon dioxide instead of the traditional r134a refrigerant because it works better in a heat pump and, if it escapes, it is environmentally harmless. In cold weather the roof-mounted system is also used as a heat pump, recovering heat from atmospheric air. 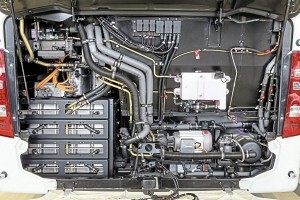 The system will still control the vehicle’s interior climate during the recharging process. 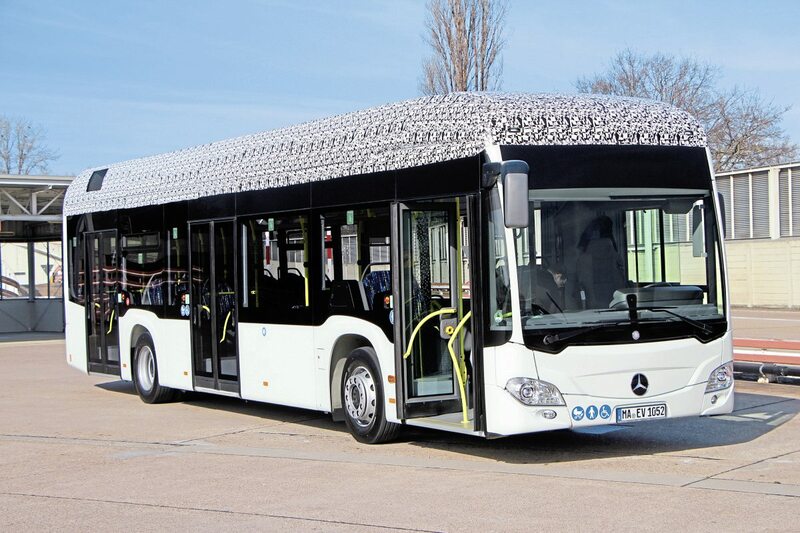 Though the roof-mounted equipment makes the bus taller than a standard Citaro, in all other key dimensions the size is the same as other Citaros, and the vehicles will be built on exactly the same production lines at Mannheim. Similarly, the interior dimensions are the same and apart from the performance characteristics and different dash, the bus is just like its diesel, hybrid and gas counterparts. The bus can be customised and specified in exactly the same way as other Citaros. 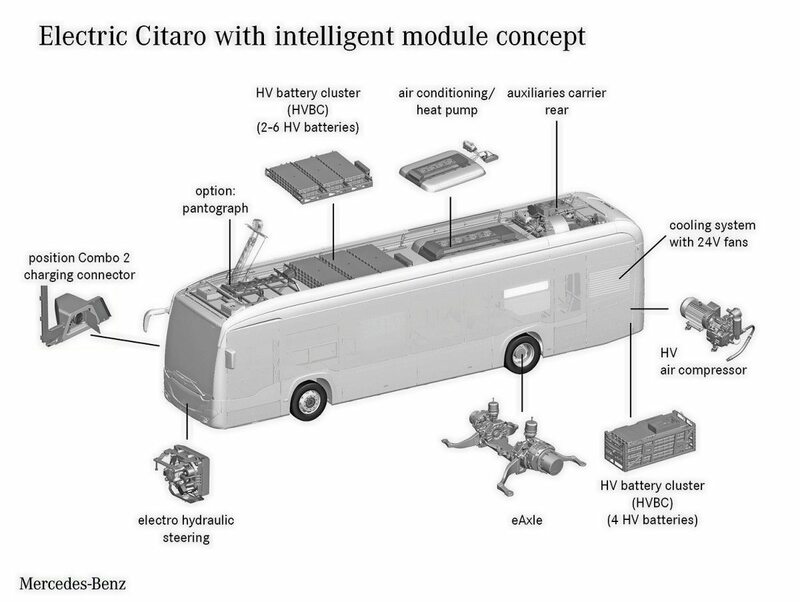 In weight and capacity terms, an additional 2.5tonnes of batteries (ten modules) is only partially offset by the absence of a diesel engine but the bus nevertheless achieves a passenger capacity of around 80 people, the reduction all being in standee places. 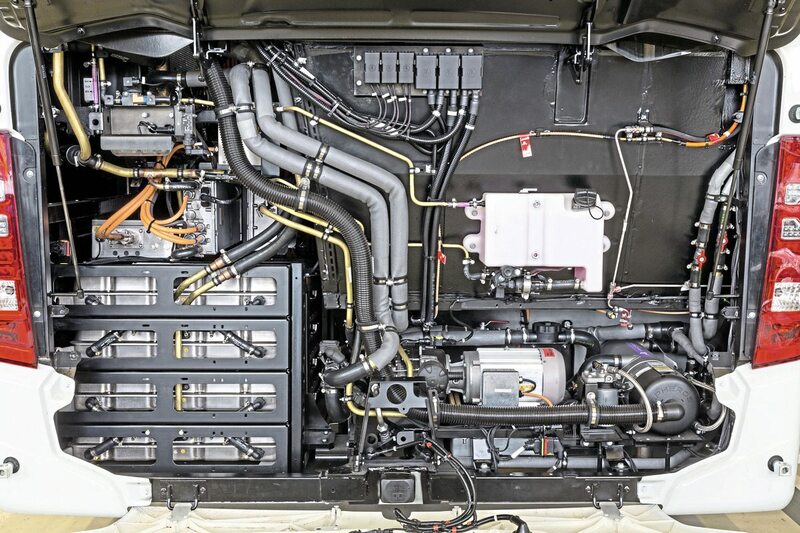 The weight of a Citaro with the full ten battery modules is around 13.7 tonnes giving a 5.8tonne payload. After travelling on the Citaro Hybrid last September, the same bus was provided to ferry journalists to the Untertürkheim test track facility. Just as before, I could tell no difference in the passenger experience between it and a standard diesel Citaro… but the hybrid wasn’t what I was waiting to experience. 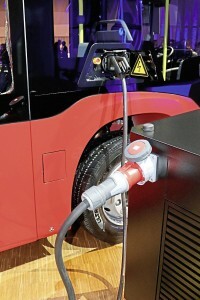 The first opportunity to ride on the electric Citaro – which will not go into production until later in the year and will only be fully unveiled to the public at the IAA exhibition in Hanover in September – was a rare one, and even rarer to be given access to the Untertürkheim test facility where cars, vans and trucks from the Mercedes-Benz range are tested. 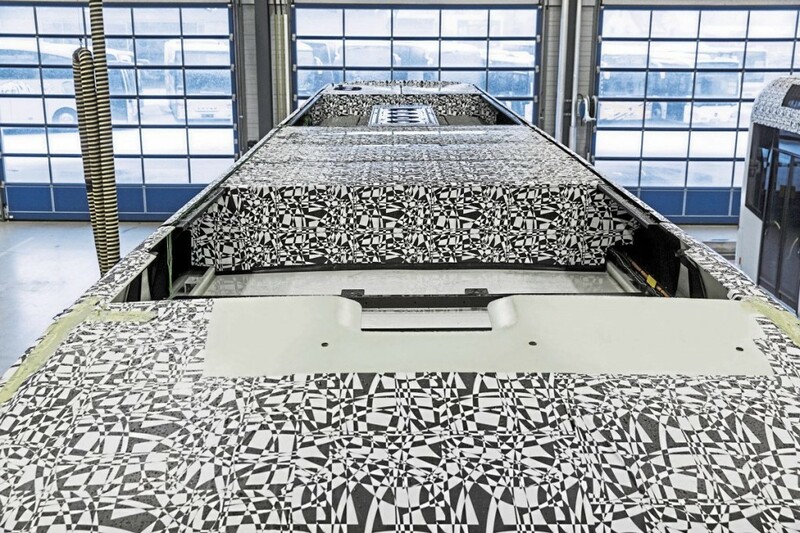 In keeping with testing convention, the entire roof section of the Electric Citaro was disguised with black and white camouflage vinyl but we were nevertheless allowed to take pictures of it before boarding. Inside, though there are changes to the dash, a temporary table was installed in the low floor area and there was an additional video display, it appeared much as any other current Citaro. Pulling away was smooth and swift, with very little noise generated in the process and despite the presence of batteries and other equipment on the strengthened roof, it appeared just as stable as a diesel bus, even when being taken round long, banked corners at a very severe angle. Stopping on a steep hill it experienced no difficulty in pulling away. A power meter display replaces the rev counter on the dash in the driver’s cab. 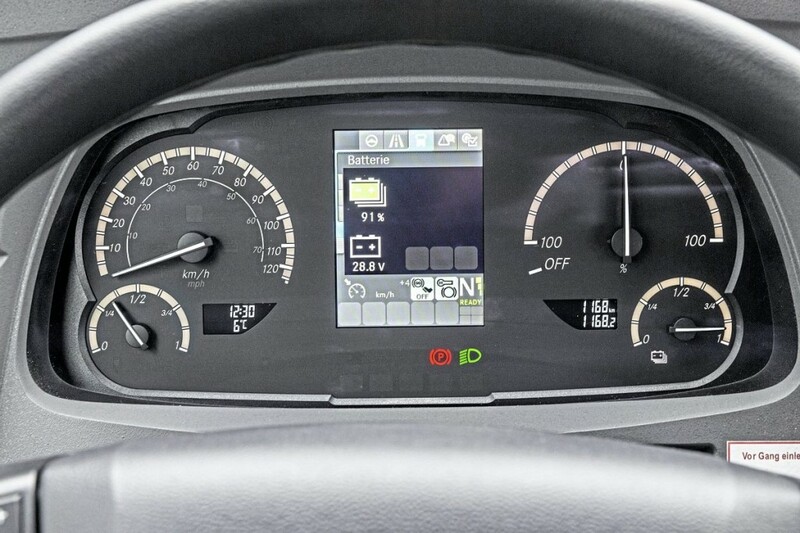 The video monitor on board mimicked the display showing on three gauges the position with regard to speed, power and stat of charge. In addition, the temporary monitor gave real time details of the flows in and out of the auxiliaries, heating system and HV Battery which were illustrated by flow arrows on a picture of a Citaro. Use of the brake pedal, throttle and brake lever were also shown together with the brake air pressure in the front and rear axle. Time moves rapidly in today’s commercial industry and while there have been no shortage of high-quality model introductions in recent years, I have no doubt that Daimler’s representatives would dearly like to be offering full electric Citaros within a shorter time frame than they can, giving competitors such as those from China less of a head start. 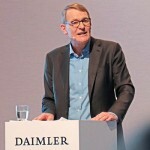 Nevertheless, Daimler are not prepared to compromise on a development process that has already been running for several years. No price information has been divulged but prices will have to be competitive if the kind of volumes that have traditionally been achieved across developed markets are to be maintained in an environment that has never been so dynamic and unpredictable. Reputation, brand loyalty and a strong existing network will count for a lot, but in the bus market particularly, new man Till Oberwörder will face some tough challenges and difficult decisions in the coming years if he is to maintain Daimler Buses’ dominant position in the market. 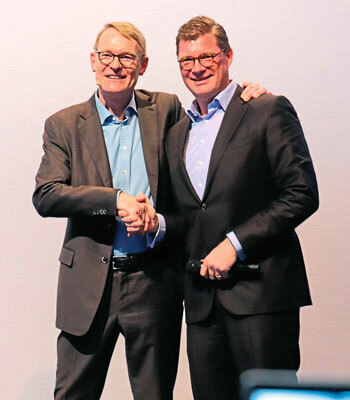 Head of Daimler Buses, Hartmut Schick, described a company in rude health, in his final presentation before taking on the new role of head of Daimler Trucks Asia. 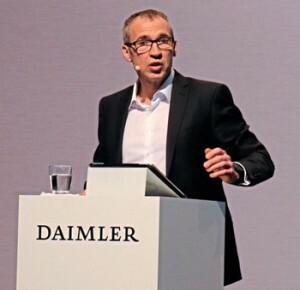 After more than nine years in the job, he is to hand over to Till Oberwörder, currently head of worldwide sales and service for Mercedes-Benz Trucks, whose previous experience, including a spell heading the Daimler Buses sales function, engenders him both familiar with the organisation and well qualified to take on the role. The two men appeared on stage together and posed for pictures. Hartmut Schick & Till Oberworder. Hartmut said Daimler Buses had maintained or expanded its number one position in its core markets in 2017, though only in Brazil where its share is over 50%, and Argentina where 65.5% was achieved, grew significantly. Europe was stable, Mexico declined slightly, the Turkish market was difficult and significantly down and India also fell significantly. A market share of 28.4% had been achieved in Europe. Sales had risen by 9.0% to 28,700 units and the EBIT figure was €243m. A return on sales (ROS) of 5.6% was achieved which was close to the target figure of 6.0%. Overall it had been a good year for the business and for EvoBus it had been the best year in its history. Hartmut thanked the business’s 18,300 staff for their contribution. The European production network is being reinforced with key competences assigned to particular plants. Agreements reached that will see Mannheim concentrate on urban bus and electromobility, Neu Ulm on touring coaches and safety and assistance systems while Holysov in the Czech Republic will take over manufacture of the complete touring coach bodyshell (for Setra) as well as continuing to supply bus body parts. Around €140m is being invested in the European network. Looking to the future, the product range is strong and is being joined by models developed from the new Sprinter range. He also stressed the importance of providing services, highlighting the Mobility Solutions operation, including eMobility Solutions, which helps advise operators and cities on technical and economic issues if they want to introduce electric buses. Daimler will, he said, continue to invest in the four megatrends encapsulated within the ‘CASE’ acronym; Connectivity, Automated driving, Shared mobility and Electric drives with €200m scheduled to be invested by 2020, as well as co-operations with other areas of the Daimler group. Concluding his presentation, Hartmut Schick said that Daimler Buses is ushering in the era of electromobility with the first electric urban bus to carry the three-pointed star. “We have set our priorities in this way,” he said, adding that the e-drive system is “extraordinarily efficient” and has set a benchmark for electrically driven urban buses. 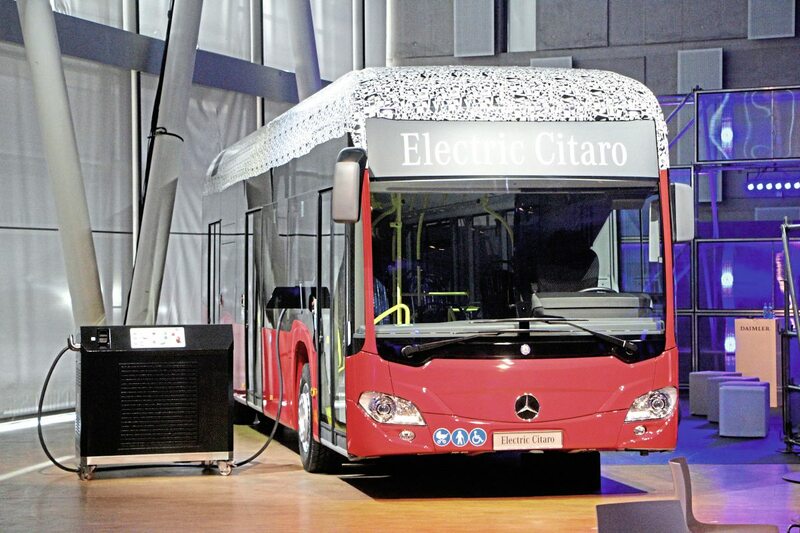 He emphasised that the electric Citaro will meet the high quality standard that brings customers to the Mercedes-Benz brand 100% – “from the get go,” as he put it. 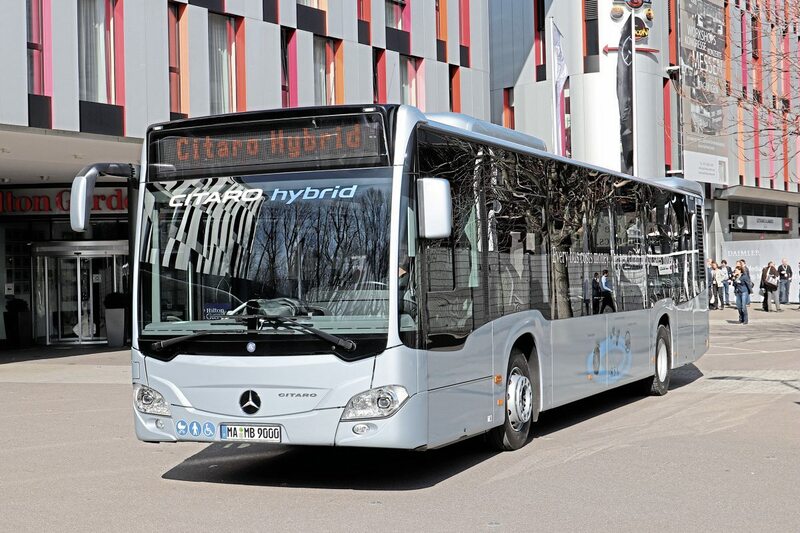 After lengthy testing the first Citaro will start customer trials in Germany in May and at the end of the year will go into series production in Mannheim.